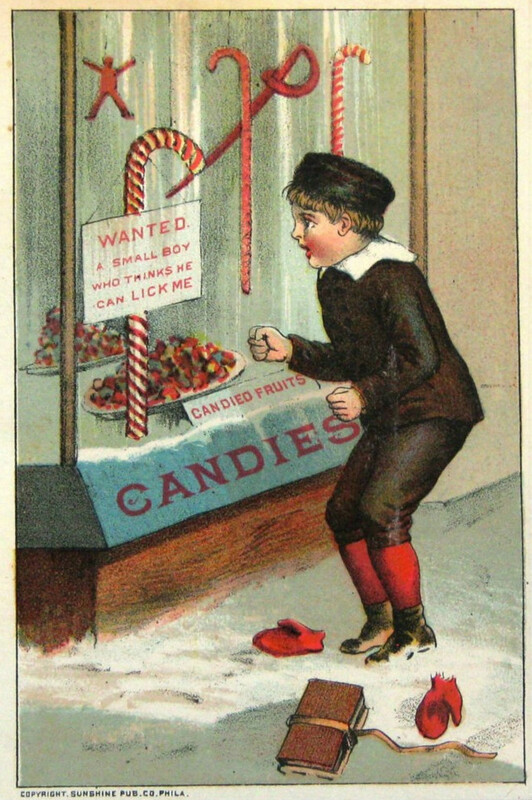 The candy cane, that red- and white-striped hard candy imbued with peppermint oil, is a signature confection of the winter holidays. Peppermint has a long history of cultivation and both medicinal and culinary use. Infusions of the plant or its extract have been used for so many hundreds of years throughout Europe, North Africa and Western Asia that the early history of peppermint candies, including cane-shaped ones, is murky. Fortunately, the biology behind peppermint’s famous aroma is better known than the story of how it came to be a Christmas staple. Botanically, peppermint is Mentha x piperata (family Lamiaceae). 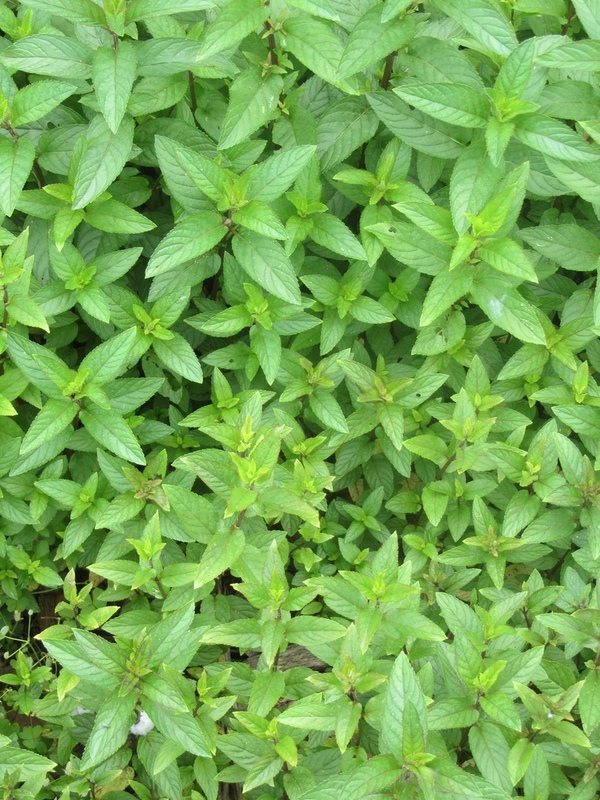 The “x” in the Latin name indicates that peppermint is a hybrid species, in this case a naturally-occurring hybrid of spearmint (M. spicata) and watermint (M. aquatica) (McGee 2004). There are around fifteen species of Mentha widely distributed across all continents except Antarctica and South America, all herbaceous plants that prefer rich, moist habitats (Bunsawat et al. 2004). All are aromatic, charismatic members of field and stream bank plant communities, but their exact number is difficult to infer because of rampant hybridization and genomic quirkiness within the genus, including polyploidy and variation in base chromosome numbers (Bunsawat et al. 2004). Peppermint and its parent species are native to a wide swath of Europe and western Asia. Like tarragon, peppermint is sterile and only reproduces vegetatively, spreading from underground rhizomes or sprouting from cuttings. So the peppermint in my garden is nearly genetically identical to its clonal progenitor identified from the wild hundreds of years ago. The signature aroma of peppermint essential oil comes from a group of monoterpenes dominated by menthol and related menthone and menthyl acetate. These and other components of peppermint’s essential oil are synthesized and stored in glandular trichomes, specialized projections of the epidermis covering all aerial parts of the plant (stem, leaves, flowers). The glandular trichomes sit like water balloons on the epidermal surface and are surrounded by different, hair-like trichomes, which may function in anti-herbivore defense or help plant energy balance by deflecting excess solar radiation or affecting the plant’s immediate micro-climate. Those hair-like trichomes make some mint family plants look and feel a bit fuzzy. A mature peppermint leaf might have as many as 8000 glandular trichomes dotting its surface (Croteau et al. 2005). SEM of peppermint trichomes. The glandular trichomes full of essential oil are yellow. The hair-like trichomes look like spikes. Photo source here. As I discussed on our post on lemon flavor, these two types of trichomes are typical of Lamiaceae species. Each of the legion mint family culinary herbs (rosemary, thyme, oregano, marjoram, basil, savory, lavender, sage, mints, shiso, lemon balm) is characterized by a signature essential oil blend synthesized in glandular trichomes. Even what we might consider gentle handling of the plant will rupture the glandular trichome cuticle and release the aromatic essential oil. The oil is the plant’s defense against generalist insect herbivores and pathogens. An insect or fungal pathogen may experience the essential oil release as a caustic deluge, but for us it’s a culinary convenience. 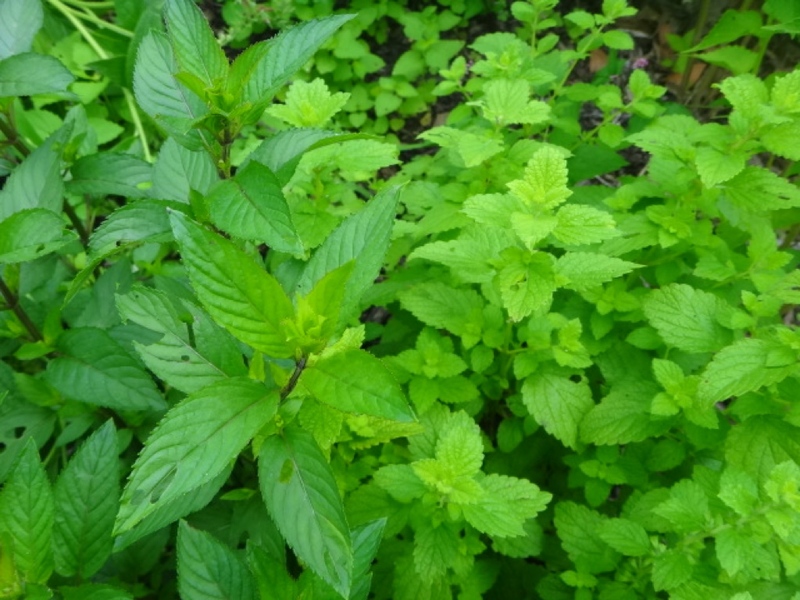 It also means that you should take care when you muddle your mints for mojitos or juleps or fresh mint syrup, and you shouldn’t steep your mint tea too long, as the desirable mint flavor is easily released from the surface of the plant, and too much bruising will release the plant’s juice, which may be bitter. Most of the components of mint family essential oils are monoterpenes or their derivatives. Monoterpene biosynthesis within the trichomes is typically characterized by many steps starting from primary metabolism in which an intermediate compound is modified by a particular enzyme. Many of the intermediates are terpenoids that are strongly aromatic in their own right and contribute to a plant’s essential oil bouquet. For example, the monoterpene limonene, which is a signature component of citrus (Rutaceae) essential oil, is one of the eight intermediate compounds in the biosynthesis of menthol (Croteau et al. 2005). 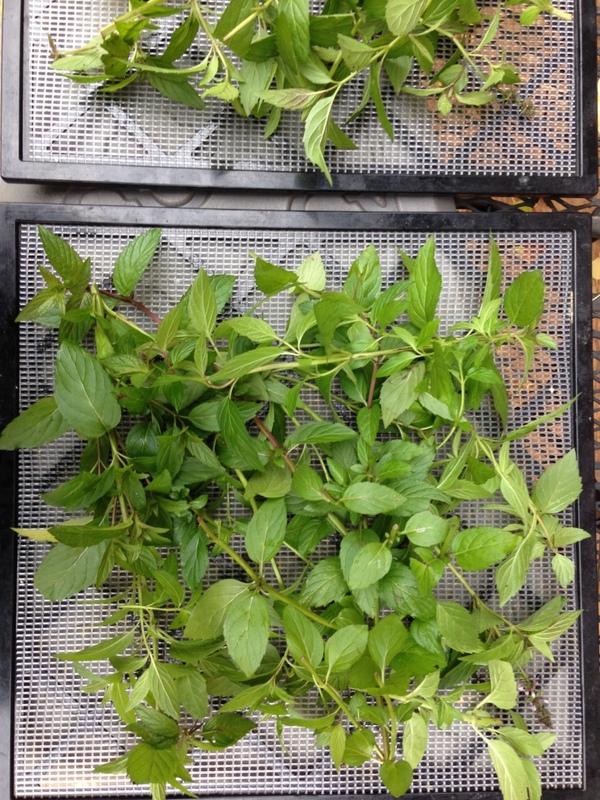 Its accumulation contributes to the lemon or orange notes in many mint family herbs. Even though spearmint is one of peppermint’s parent species, it has no menthol in its essential oil. The signature aromatic monoterpene in spearmint essential oil is carvone (specifically, the isomer of carvone denoted (-)-carvone). Limonene is an intermediate step in its biosynthesis, too, and the enzymes that modify limonene in spearmint and peppermint are similar, demonstrating how small genetic modifications to the genes encoding the enzymes responsible for monoterpene synthesis can lead to big changes in the resulting essential oils (Croteau et al. 2005). Interestingly, the other parent species of peppermint, watermint, also doesn’t produce menthol. Its essential oil is dominated by menthofuran (Bozin et al. 2006), which has a musty odor and is highly toxic. I haven’t seen a good description of how the two different monoterpne synthesis pathways in spearmint and watermint sire a completely different pathway in peppermint. Menthol is perhaps the most recognizable monoterpene in the Western world and is hugely commercially important as a peppermint flavoring and ingredient in fragrances and topical medicines (Croteau et al. 2005). The refreshing peppermint aroma of menthol is not the only reason it is desirable in medicines applied to the skin and in confections. Menthol induces a cooling sensation on the skin and mucous membranes. It triggers our neural receptors that sense cold (TRPM8 receptors), and we perceive menthol to feel cool. Menthol, then, is the phytochemical opposite of capsaicin from chili peppers, which triggers heat-sensing neurons, making capsaicin feel hot. Menthol also triggers opioid receptors to function as a topical analgesic (Galeotti et al. 2002). Peppermint tea is still recommended as a folk herbal remedy for nausea or other digestive discomfort, and, of course, menthol clears the sinuses. I loved the part of the Celestial Seasonings factory tour in Boulder, CO, when they opened the garage door blocking the mint room, where they store all their dried peppermint, so its strong aroma doesn’t contaminate the other herbs. The wave of accumulated menthol that rolled over the waiting crowd brought tears to everyone’s eyes and forced us all to take a deep, minty cleansing breath. It has never really made sense to me that a cooling plant extract should be a hallmark of the coldest part of the year. Perhaps, however, peppermint’s long history as part of a home remedy for winter cold symptoms contributed to the tradition of peppermint holiday confections, and that resonates with me. And in the sense that the menthol wave in the tea factory brought the present moment sharply into focus, peppermint fostered a somewhat spiritual experience. So perhaps minty candy canes are not so incongruous this time of year after all. Bozin, B., Mimica-Dukic, N., Anackov, G., Zlatkovic, B. and Igic, R., 2006. Variability of Content and Composition of Mentha aquatica L.(Lamiaceae) Essential Oil in Different Phenophases. Journal of Essential Oil Bearing Plants, 9(3), pp.223-229. Bunsawat, J., Elliott, N.E., Hertweck, K.L., Sproles, E. and Alice, L.A., 2004. Phylogenetics of Mentha (Lamiaceae): evidence from chloroplast DNA sequences. Systematic botany, 29(4), pp.959-964. Croteau, R.B., Davis, E.M., Ringer, K.L. and Wildung, M.R., 2005. (−)-Menthol biosynthesis and molecular genetics. Naturwissenschaften, 92(12), pp.562-577. Galeotti, N., Mannelli, L.D.C., Mazzanti, G., Bartolini, A. and Ghelardini, C., 2002. Menthol: a natural analgesic compound. Neuroscience letters, 322(3), pp.145-148. This entry was posted in Flavor, herbs, Uncategorized and tagged aroma, candy cane, essential oil, flavor, fragrance, hybrid, Jeanne L. D. Osnas, Lamiaceae, Mentha, menthol, peppermint, receptor, spearmint, trichome, watermint. Bookmark the permalink. The peppermint leaf enlargement is mind blowing–worlds within worlds. Thank you also for the link to herbalgram.